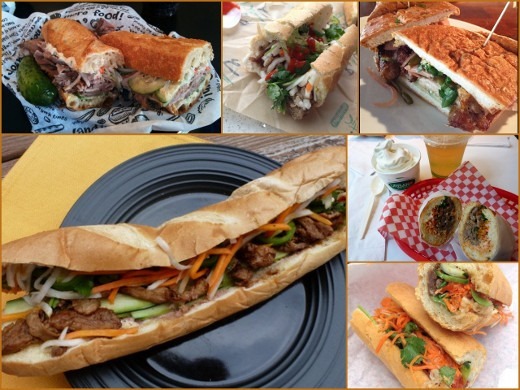 Banh Mi sandwiches have become all the rage in the food world over the past few years. I’ve tried many local renditions as well as a few on my travels, and many have been featured here on the blog. Crusty French bread – THE key ingredient, in my opinion! Heat! Chilies and Sriracha are a must for me. 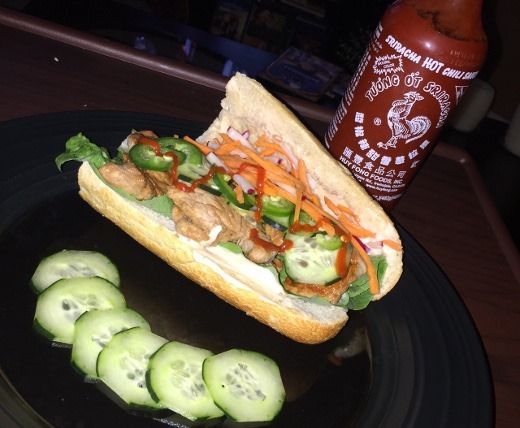 But recently, I came across a recipe in Cooking Light magazine for totally doable Banh Mi sandwiches at home and decided to give it a whirl! Spoiler alert: it was a huge success! 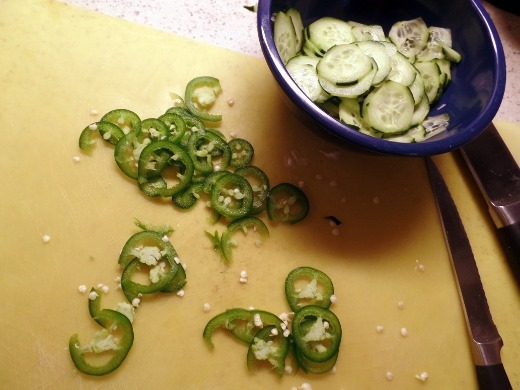 Sliced cucumber and jalapeño pepper. The second time I made these sandwiches, while slicing the cucumber, I totally whizzed off the tip of my thumb on my mandolin. OUCHIES. I highly recommend being smarter than me using the safety guard on your mandolin, kids. I learned my lesson! This recipe uses lean pork loin which has been marinated in a ginger-soy sauce for 10 minutes prior to searing quickly over high heat. Cooking Light suggests a grill pan, which I do not have, so instead I used my enameled cast iron Lodge skillet. Before you can start assembling these beauties, slice a 12 ounce loaf of French bread in half lengthwise, cut into quarters, and hollow out the top and bottom halves of the bread, retaining about a 1-inch shell of bread. I like to warm up the bread in my oven for a couple minutes before assembling, as well. Finally, you’re ready to create your Banh Mi. I recommend assembling in this specific order, suggested by Cooking Light’s recipe. I did it out of order the second time and it was a mess! Place the top halves of the bread over the sandwich and eat! 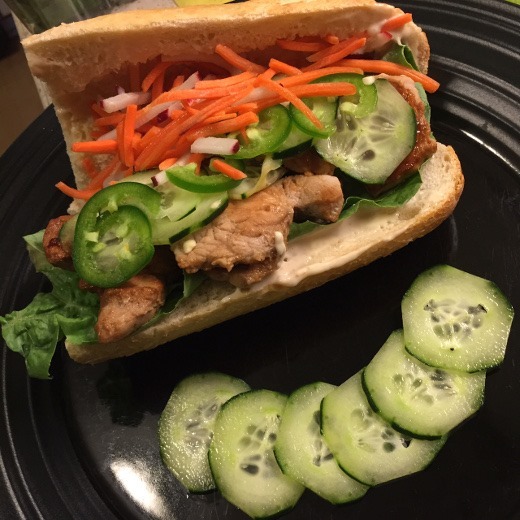 Granted, Cooking Light offers a relatively quick and easy version with a few shortcuts compared to an “authentic” Banh Mi (whatever that means) but I sure enjoyed it! I was, and AM, so impressed that I was able to quickly and easily assemble these hearty sandwiches that were packed with flavor on a weeknight at home and can see myself returning to this recipe again and again in the future. My #1 tip is to be sure to buy a quality French bread with a nice crusty exterior as that is what really makes this sandwich! 1. Combine first 5 ingredients in a medium bowl, stirring with a whisk. Add pork, turning to coat. Let stand 10 minutes. 2. Prepare Radish and Carrot Slaw; set aside. 3. Heat a grill pan over high heat. Coat pan with cooking spray. 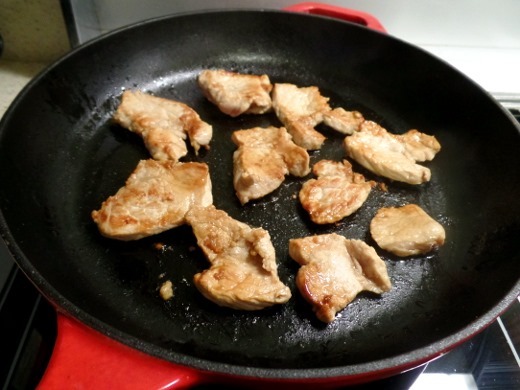 Arrange half of pork on pan; grill 1 1/2 minutes on each side or until done. Remove pork from pan. Repeat procedure with remaining pork. Hollow out top and bottom halves of bread, leaving a 1-inch-thick shell; reserve torn bread for another use. 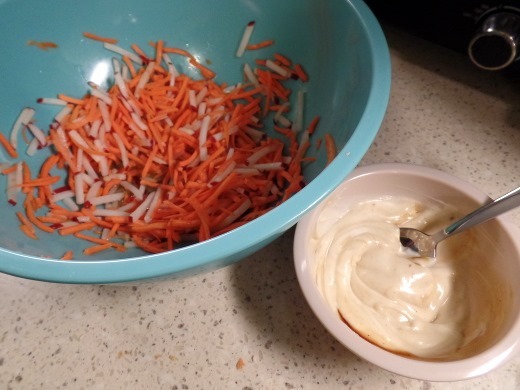 Combine mayonnaise and hoisin in a small bowl. Spread mayonnaise mixture evenly over top halves of bread. 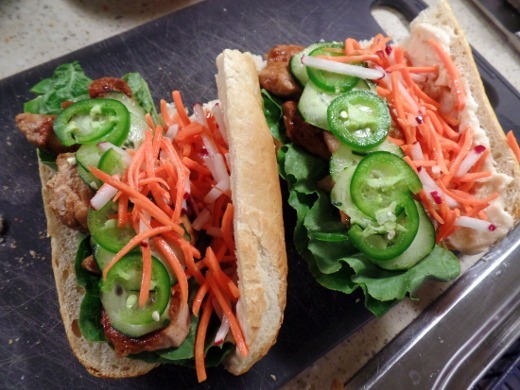 Arrange lettuce over bottom halves of bread; top evenly with pork, cucumber, jalapeño, and Radish and Carrot Slaw. Drizzle with Sriracha to taste. Top with top halves of bread. Would I Make It Again? : You betcha. Have prepared these two times now. What I’d Do Differently Next Time: Prepare more hoisin mayo! Use the safety guard on my mandolin slicer so I don’t slice my thumb off! Definitely use a grill pan to cook the spices of pork if you have one, as this allows the pork to remain elevated from the liquid that cooks off and allows for a nice caramelized sear on the pork. I used a regular skillet since I don’t have a grill pan, but I can understand the benefit in using a grill pan. But how do you get to a rating so precise as 9.2?!? Looks like a tasty sandwich.